I’d been meaning to try the Boscia Luminizing Black Mask for quite some time, so when I got it in a Sephora Beauty Insider promotion, it didn’t take me long to go run to buy a full bottle (that I’m now almost out of!). First of all let me say, I am a huge face mask junkie, and I will try any and every face mask on this planet. Next, let me say that this mask is not for the faint of heart. It’s serious. Like, super serious. Why is it so serious? Well, because it pries every single yuck thing out of your skin…and when I say pries, I mean it. It’s not the most comfortable experience, but boy does it get the job done. This is a mineral peel-off mask- it applies like liquid and peels off as one whole mask. The first time I applied it I was a little shocked by how uncomfortable it was to take off. It was a little painful, but I don’t want me using that word to deter anyone from using it, because it’s also easily the best mask I have ever used. Any doubts I had were instantly erased when I saw what my complexion looked like immediately after removing it. 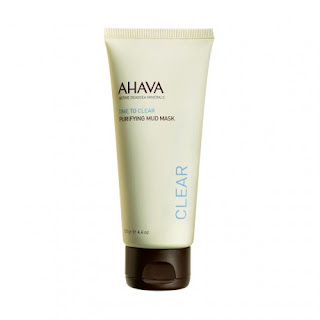 The black mask is an exfoliator, and it clears the skin of all dirt and other impurities. When you remove the mask, you can see everything it pulled out of your skin…it’s kinda creepy and downright gross in that regard…but also totally awesome at the same time. Did that make sense? The “immediately visible results” claim is no joke. My complexion was instantly brighter and unbelievably smoother. I have sensitive skin and while I did experience some redness after using the black mask, it wasn’t enough for me to say AH I’M NEVER USING THIS AGAIN. If you’ve read any reviews on this product you’ll see a lot of people complaining about the peel-off part. I promise you, the results far out weigh the annoying-ness of taking off the mask. I mean, isn’t there a saying beauty is pain? Right? Okay then. Anyway, I’ve given samples to my friends and even they have agreed, it’s just too great of a mask to allow the peel-off process to deter you away from it. 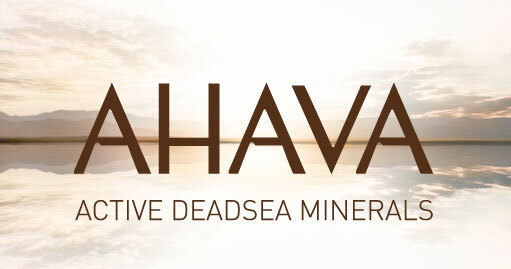 If you’re looking for a new intensive face mask, one that will seriously rid your complexion of all the unwanted dirt and grime, I highly suggest this product, it’s so amazing and will instantly change the look and feel of your skin. I was recently given the opportunity to try out a few of Racinne’s products from their Ultimate Aqua Blanc Series. If you’re unfamiliar with Racinne it’s a skincare company based out of Canada focused on biotechnology and the use of various herbs to create skincare lines aimed at treating different skin types and focus issues. Racinne has three different lines, Ultimate Youth Power, Ultimate Hydra Perfection, and the one I sampled, Ultimate Aqua Blanc. I had requested to sample Aqua Blanc because its ingredients best suited my skin type. According to Racinne’s site, Aqua Blanc products contain an “effective brightening formula penetrat[ing] deep into the core of skin cells to facilitate self revitalization and regeneration, correcting enlarged pores, balancing oil distribution, reducing dark spots to reveal brightened, glowing looking skin”. I need that oil balance and the brightening agents, so I was super excited to try out the Ultimate Aqua Blanc Brightening Masque. When I first applied this mask it just resembled a thick moisturizer, no color or anything, and certainly not messy to apply. The purpose of the Brightening Masque is to “promote skin rejuvenation, strengthen moisture level and reduces pigmentation”. It also helps with UV damage, which unfortunately I think every young woman has to deal with these days. I can say without a doubt it increased moisture level just in the short amount of time I had applied it. The directions say to leave on for 15mins, wipe of excess, and then rinse your face. I left it on for probably close to 25-30mins while I took a bubble bath. Then I wiped it off and rinsed. My skin felt so supple and soft, I was really impressed! I have to say I wasn’t expecting to notice the effects instantly my first time using it, but I definitely saw a brightness in my face that wasn’t there before I applied it. I would suggest using this product in the AM before going out on the weekend or something, since the brightness results really are instant you wouldn’t want to apply it at night and then go to sleep. I’d say only apply in the evening if you’re about to go out and party the night away! I applied the mask again a about a week after first using it and had the same results, which tells me that the Ultimate Aqua Blanc Brightening Masque is a consistent product, which is what I aim for when adding new products to my routine. 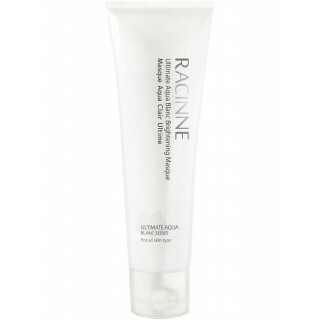 You can purchase the Ultimate Aqua Blanc Brightening Masque and other Aqua Blanc products on the Racinne website! Stay tuned for some more Racinne reviews coming soon. I’m def a fan of Juice Beauty products, I used to use their Blemish Clearing Serum & loved it. 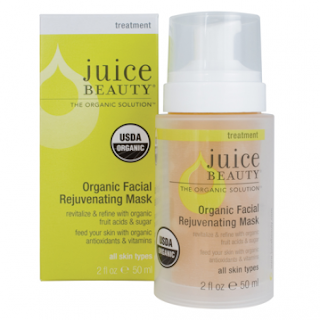 [I just decided to switch up my routine, but I’ll most likely go back to it] but recently I’ve been obsessed with [and 2x a week using] their Organic Facial Rejuvenating Mask. When I was home for winter break I promised myself I’d used this mask twice a week. Thank god I did that, the difference in my skin is amazing! We all know the winter months can be harsh, back home in Jersey it was particularly windy, but I really wanted to try to keep my skin looking above-average fresh and radiant. Well, that’s exactly what I did, & it was all thanks to Juice Beauty! Best part about this mask? It works well for every skin tone, the main focus is infusing your skin with antioxidants & vitamins, and from the looks of my results, that’s exactly what it does! & added bonus, absolutely no breakouts whatsoever the whole holiday season. BOOM. 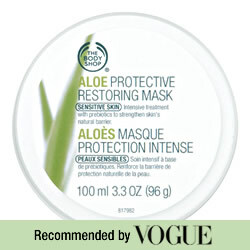 I recently purchased the Body Shop’s Aloe Protecting Restoring Mask, and I reallllyyyy realllyyy likeeeee itttt!! First of all, it’s recommended by Vogue, so obviously it must be good. But, that’s not the reason I bought it. 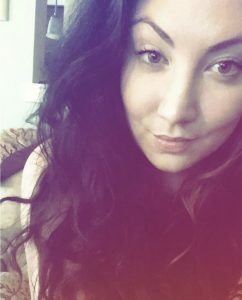 I tend to have some redness sometimes on certain areas of my face, you can never tell with makeup on, but I don’t always want to wear makeup. SO, I need something to combat this issue. We all know aloe heals sunburn, so using aloe in a mask form for the face just makes sense. Duh. 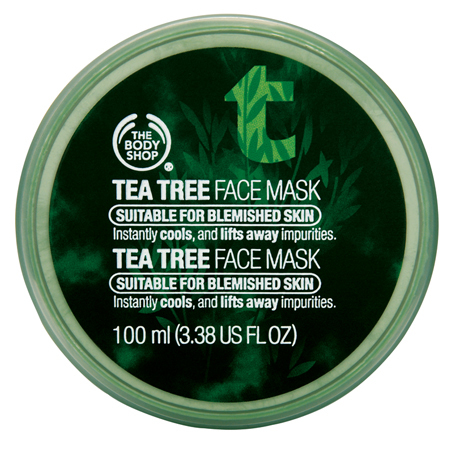 This mask is very cooling and refreshing, it doesn’t have that ‘stingy‘ feeling most masks do. I’m using it weekly, and I hope to see results soon! Although, if I don’t I don’t think I’ll necessarily mind, it’s just nice to use once a week to unwind, it’s very relaxing. 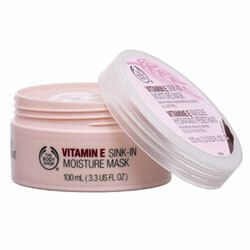 Anyway, the texture is very creamy, so it applies more like a moisturizer than your typical face mask does. I think this mask will really show its true colors in the winter weather when everyone’s skin is battling the harsh coldness. Hopefully it’ll keep me hydrated and glowly during the winter! 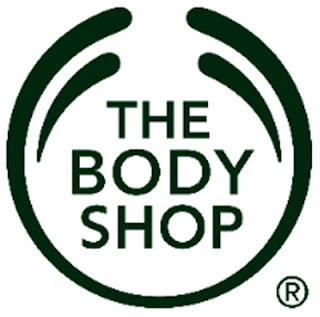 I def suggest this product, as always I love love love The Body Shop. If you’re a little weary on the price just sign up for their emails, they’re always sending out coupon codes and deals — I recently saved over $70 and ended up paying only about $30 for my order. Perfection, right? I decided this was a perfect time to write about the Body Shop Vitamin E Moisture Mask because…it’s currently on my face. If you don’t know, vitamin E is fabulous for your skin…and your body in general. It’s an antioxidant which helps the skin battle pollution and sun damage. It also seriously helps in the anti-aging category. It can help reduce fine lines and wrinkles and keeps the skin super hydrated. Lastly, it can also help fade any scars you may have, for example any acne scarring. It’s basically a super thick lotion, you apply it all over the face and leave it on for however long you’d like. They suggest minimum 10 minutes…you can even sleep with it on if you have super dry skin and are looking for a serious treatment. Also, you just tissue off the mask, no water required, which helps to allow the moisture to be locked in. The main ingredients are vitamin E (duh), cotton seed oil, rice bran, and organic soya oil. These other ingredients (besides the vitamin E) have repair and healing properties in them which is why the longer you leave it on, the potentially better results! 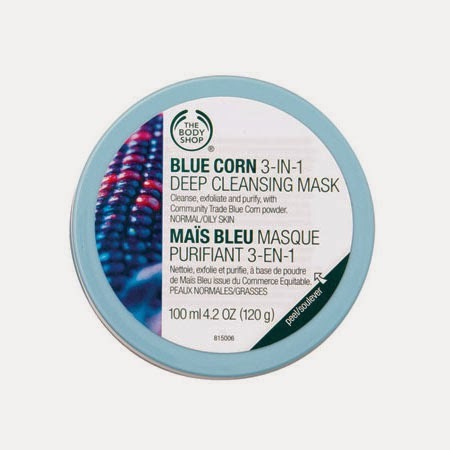 I really love this mask and I try to use it once a week. It’s very calming and cooling, unlike most masks that have the tingling feeling to them. 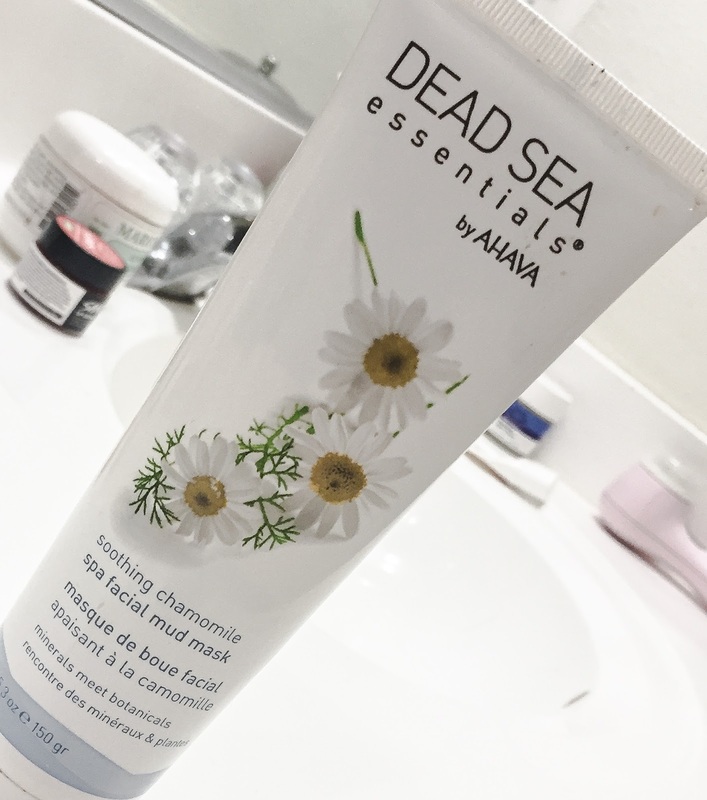 You have to remember the purpose of this mask is not to clear up skin or unclog pores– it’s to hydrate and repair aging or sun damage. This will be perfect to battle the harsh winter weather, even though we still have a few more months…keep this mask in mind!